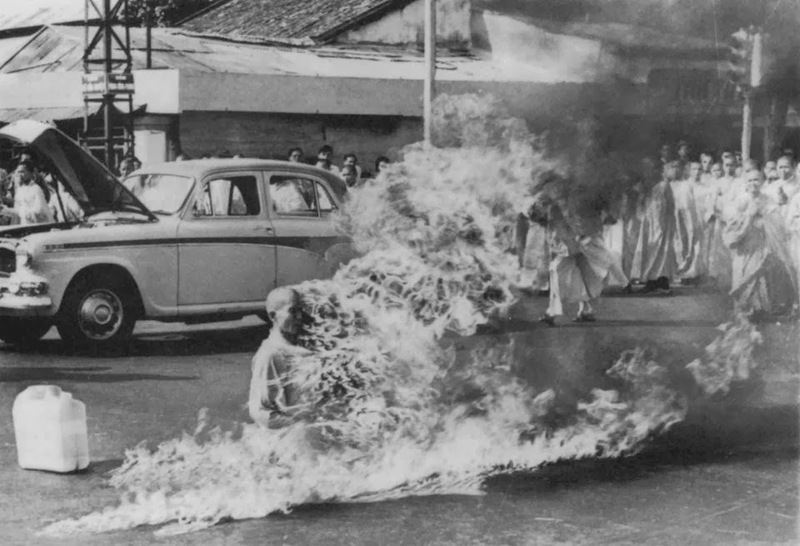 11th June 1963, Vietnam : In Vietnam there is a small Buddhist uprising going on, protests against the Diem regime are now commonplace and have been so for one month. A small group of American journalists have gathered outside of the Cambodian Embassy in Saigon, the busy road intersections traffic produced a low roar which permeated the air, the Journ...alists had been told that the Buddhists would do something, but they didn’t know what. Suddenly they notice a fuss, a small car approaches, it is a pale blue Austin Westminster, it is being followed by 2 phalanxes of Buddhists, 350 Monks and Nuns in total. In the wind their banners wave, they are in English and Thai, denouncing the Diem government and its persecution of Buddhists and other religious groups. The car and procession stops. The event begins. Thich Quang Duc and two other monks emerge from the car, the two other monks go the boot of the car and pull out a 5-gallon gasoline can and a cushion. The monk puts the cushion down in the centre of the road and the Buddhists form a circle around the site. Thich Quang Duc sits down in the Lotus position, and in this meditative position, his colleague emptied the whole 5 gallons of gasoline over him. Thich Quang Duc showed no apprehension or fear, there was nothing but calm as he started rotating a string of wooden prayer beads and chanted a homage to Amitabha Buddha. He then stopped the chanting, struck a match and then dropped it upon himself. He ignited instantly, his self-immolation began. Flames consumed his robes and flesh, black oily smoke billowing out. During the burning, most spectators were shocked into silence, many people tried to save him but were repelled by the Buddhist circle. Others prostrated themselves before him. All the while he displayed nothing but calm, no sound or expression crossed his lips. A Vietnamese monk chanted over the microphone for the duration. He declared, “A Buddhist priest burns himself to death. A Buddhist priest becomes a martyr.” After ten minutes the burning stopped and the withered corpse was picked up and put into a coffin, too stiff to be moved very much, it was carried to the car with one withered arm hanging out.Afterwards things became even more… curious. That night hundreds of Vietnamese claimed to see the face of Buddha in the sunset, and that Buddha wept. The night of his re-cremation and funeral was the 19th June the monk was cremated properly so he could be buried, but something was left. By the end of the cremation his heart remained intact, refusing to burn. It was seen as a sign of his great compassion. To this day that heart is a holy relic, the heart of Thich Quang Duc in a Glass Chalice.